English: The Ryuo's Work is Never Done! Published: Sep 15, 2015 to ? Ryuuou no Oshigoto! placed first in the Kono Light Novel ga Sugoi! ranking in the best light novel category in 2017. 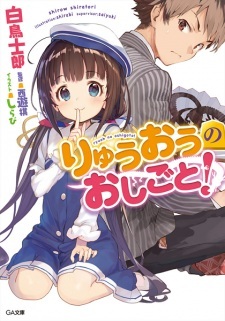 The series has been published digitally in English as The Ryuo's Work is Never Done! by Bookwalker Global since October 24, 2017. Alternative version: Ryuuou no Oshigoto!